Clorox (CLX) Surges 24% in 3 Months: More Room to Run? The Clorox Company’s CLX robust earnings surprise history and progress on the 2020 Strategy have helped it gain momentum in recent months. Notably, the company delivered a positive earnings surprise in the last seven quarters. Shares of this Zacks Rank #3 (Hold) company advanced 24% in the past three months, outperforming the industry’s 8.4% growth. Moreover, the stock has been doing well since the earnings beat in fourth-quarter fiscal 2018 and the issuance of an encouraging outlook for fiscal 2019. The quarterly release sent the stock up 10.5% since Aug 2. Further, the stock is trading near its 52-week high of $150.40. Clorox reported bottom-line beat in fourth-quarter fiscal 2018, while both earnings and sales improved year over year. The bottom line was driven by higher revenues, lower tax rate and advertising and sales promotion costs as well as gains from cost savings, and a lower effective tax rate. Higher volumes owing to innovation and rise in prices aided the top line. Notably, sales and earnings included contributions of 3 percentage points and 8 cents per share, respectively, from the Nutranext acquisition. Following the strong quarterly results, management provided a robust view for fiscal 2019. For fiscal 2019, management anticipates earnings per share from continuing operations to be in the range of $6.32-$6.52, up from $6.26 last year. Clorox now projects revenue growth to be in the 2-4% band over fiscal 2018 level. The upside is likely to be backed by innovation and combined positive effect of the Nutranext acquisition and the Aplicare divestiture. Currently, analysts have become optimistic on the stock’s performance. This is evident from the uptrend in its earnings estimates over the last 30 days. The Zacks Consensus Estimate of $6.41 for fiscal 2019 and $6.87 for fiscal 2020 moved north by 5 cents and 15 cents, respectively. Clorox remains keen on the smooth execution of its 2020 Strategy, which is aimed at boosting growth for the improvement of categories and overall market share. The strategy aims at achieving certain long-term aspirations, including growing net sales by 3-5%, increasing EBIT margin by 25-50 basis points (bps) and generating free cash flow of 10-12% of sales, all on a yearly basis. The strategy is likely to be achieved through key accelerators like investment in brands; development of e-commerce; technological advancements; enhancement of growth culture and focus on the 3Ds – desire, decision and delight. Additionally, Clorox is well placed to improve margins through its cost saving and productivity initiatives. In fiscal 2018, it generated cost savings of more than $100 million in. Moreover, the company’s Go Lean strategy in International remains focused on improving margins through operational efficiencies. We believe these strategies will help the company to offset near-term challenges. 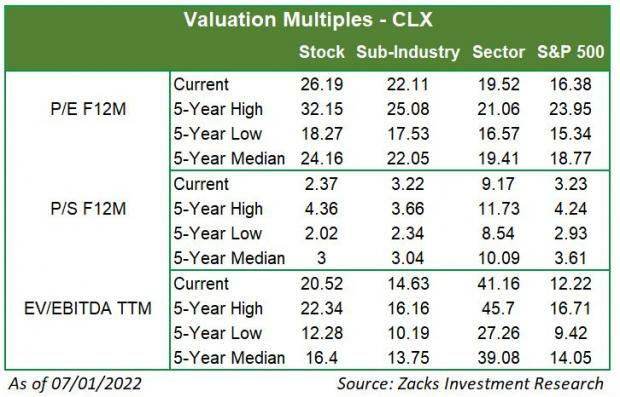 Despite a solid performance, Clorox has been witnessing strained gross margins for a while now due to higher elevated commodity and logistics expenses. Further, a 60 bps of unfavorable impact from costs associated with the Nutranext buyout dented gross margins in the fiscal fourth quarter. For fiscal 2019, the company estimates gross margin in the range of flat to up at a modest rate backed by gains from higher prices and cost-savings efforts. However, rise in commodity and logistics spending remain concerns. Further, the company anticipates higher cost pressures from commodities and the transportation market, which are likely to weigh on its margins. Though management expects to witness gross margin expansion in the second half of fiscal year 2019, gross margin is likely to remain soft in the first half owing to increased commodity expenses. Though concerns regarding margins remain, Clorox’s ongoing strategies provide visibility for growth in the future. This is further supported by the company’s long-term earnings growth rate of 7.5% and a Momentum Score of B.
MEDIFAST INC MED pulled off an average positive earnings surprise of 16.6% in the trailing four quarters. It has a long-term earnings growth rate of 20% and sports a Zacks Rank #1 (Strong Buy). You can see the complete list of today’s Zacks #1 Rank stocks here. Ollie’s Bargain Outlet Holdings, Inc. OLLI delivered an average positive earnings surprise of 9% in the trailing four quarters. It has a long-term earnings growth rate of 23% and a Zacks Rank #2 (Buy). Helen of Troy Limited HELE delivered an average positive earnings surprise of 21.6% in the trailing four quarters. It has a long-term earnings growth rate of 6.1% and a Zacks Rank #2.